Airport Marina Honda - Your Helpful Honda Dealer! 2019 Honda Insight LX Crystal Black Pearl 1.5L I4 SMPI Hybrid DOHC 16V LEV3-SULEV30, CVT. Airport Marina Honda! www.airportmarinahonda.com, Excellent Selection of Used Vehicles, Financing Options, Serving Manhattan Beach, Westchester, Mar Vista, Pacific Palisades, Santa Monica, Playa del Rey, Beverly Hills, Inglewood, Malibu, Venice, Culver City, Brentwood, Westwood, West Hollywood, Bel Air, Ladera Heights and El Segundo but all over Southern California and LA. ALL ADVERTISED PRICES EXCLUDE GOVERNMENT FEES AND TAXES, ANY FINANCE CHARGES, ANY DEALER DOCUMENT PROCESSING CHARGE, ANY ELECTRONIC FILING CHARGE, AND ANY EMISSION TESTING CHARGE”. Airport Marina Honda - Your Helpful Honda Dealer! 2019 Honda Insight LX Black 1.5L I4 SMPI Hybrid DOHC 16V LEV3-SULEV30, CVT. Airport Marina Honda! www.airportmarinahonda.com, Excellent Selection of Used Vehicles, Financing Options, Serving Manhattan Beach, Westchester, Mar Vista, Pacific Palisades, Santa Monica, Playa del Rey, Beverly Hills, Inglewood, Malibu, Venice, Culver City, Brentwood, Westwood, West Hollywood, Bel Air, Ladera Heights and El Segundo but all over Southern California and LA. ALL ADVERTISED PRICES EXCLUDE GOVERNMENT FEES AND TAXES, ANY FINANCE CHARGES, ANY DEALER DOCUMENT PROCESSING CHARGE, ANY ELECTRONIC FILING CHARGE, AND ANY EMISSION TESTING CHARGE”. Airport Marina Honda - Your Helpful Honda Dealer! 2019 Honda Insight LX Lunar Silver Metallic 1.5L I4 SMPI Hybrid DOHC 16V LEV3-SULEV30, CVT. Airport Marina Honda! www.airportmarinahonda.com, Excellent Selection of Used Vehicles, Financing Options, Serving Manhattan Beach, Westchester, Mar Vista, Pacific Palisades, Santa Monica, Playa del Rey, Beverly Hills, Inglewood, Malibu, Venice, Culver City, Brentwood, Westwood, West Hollywood, Bel Air, Ladera Heights and El Segundo but all over Southern California and LA. ALL ADVERTISED PRICES EXCLUDE GOVERNMENT FEES AND TAXES, ANY FINANCE CHARGES, ANY DEALER DOCUMENT PROCESSING CHARGE, ANY ELECTRONIC FILING CHARGE, AND ANY EMISSION TESTING CHARGE”. Airport Marina Honda - Your Helpful Honda Dealer! 2019 Honda Insight EX Crystal Black Pearl 1.5L I4 SMPI Hybrid DOHC 16V LEV3-SULEV30, CVT. Airport Marina Honda! www.airportmarinahonda.com, Excellent Selection of Used Vehicles, Financing Options, Serving Manhattan Beach, Westchester, Mar Vista, Pacific Palisades, Santa Monica, Playa del Rey, Beverly Hills, Inglewood, Malibu, Venice, Culver City, Brentwood, Westwood, West Hollywood, Bel Air, Ladera Heights and El Segundo but all over Southern California and LA. ALL ADVERTISED PRICES EXCLUDE GOVERNMENT FEES AND TAXES, ANY FINANCE CHARGES, ANY DEALER DOCUMENT PROCESSING CHARGE, ANY ELECTRONIC FILING CHARGE, AND ANY EMISSION TESTING CHARGE”. Airport Marina Honda - Your Helpful Honda Dealer! 2019 Honda Insight EX Lunar Silver Metallic 1.5L I4 SMPI Hybrid DOHC 16V LEV3-SULEV30, CVT. Airport Marina Honda! www.airportmarinahonda.com, Excellent Selection of Used Vehicles, Financing Options, Serving Manhattan Beach, Westchester, Mar Vista, Pacific Palisades, Santa Monica, Playa del Rey, Beverly Hills, Inglewood, Malibu, Venice, Culver City, Brentwood, Westwood, West Hollywood, Bel Air, Ladera Heights and El Segundo but all over Southern California and LA. ALL ADVERTISED PRICES EXCLUDE GOVERNMENT FEES AND TAXES, ANY FINANCE CHARGES, ANY DEALER DOCUMENT PROCESSING CHARGE, ANY ELECTRONIC FILING CHARGE, AND ANY EMISSION TESTING CHARGE”. Airport Marina Honda - Your Helpful Honda Dealer! 2019 Honda Insight EX Cosmic Blue Metallic 1.5L I4 SMPI Hybrid DOHC 16V LEV3-SULEV30, CVT. Airport Marina Honda! www.airportmarinahonda.com, Excellent Selection of Used Vehicles, Financing Options, Serving Manhattan Beach, Westchester, Mar Vista, Pacific Palisades, Santa Monica, Playa del Rey, Beverly Hills, Inglewood, Malibu, Venice, Culver City, Brentwood, Westwood, West Hollywood, Bel Air, Ladera Heights and El Segundo but all over Southern California and LA. ALL ADVERTISED PRICES EXCLUDE GOVERNMENT FEES AND TAXES, ANY FINANCE CHARGES, ANY DEALER DOCUMENT PROCESSING CHARGE, ANY ELECTRONIC FILING CHARGE, AND ANY EMISSION TESTING CHARGE”. Airport Marina Honda - Your Helpful Honda Dealer! 2019 Honda Insight Touring White Orchid Pearl 1.5L I4 SMPI Hybrid DOHC 16V LEV3-SULEV30, CVT. Airport Marina Honda! www.airportmarinahonda.com, Excellent Selection of Used Vehicles, Financing Options, Serving Manhattan Beach, Westchester, Mar Vista, Pacific Palisades, Santa Monica, Playa del Rey, Beverly Hills, Inglewood, Malibu, Venice, Culver City, Brentwood, Westwood, West Hollywood, Bel Air, Ladera Heights and El Segundo but all over Southern California and LA. ALL ADVERTISED PRICES EXCLUDE GOVERNMENT FEES AND TAXES, ANY FINANCE CHARGES, ANY DEALER DOCUMENT PROCESSING CHARGE, ANY ELECTRONIC FILING CHARGE, AND ANY EMISSION TESTING CHARGE”. Airport Marina Honda - Your Helpful Honda Dealer! 2019 Honda Insight Touring Cosmic Blue Metallic 1.5L I4 SMPI Hybrid DOHC 16V LEV3-SULEV30, CVT. Airport Marina Honda! www.airportmarinahonda.com, Excellent Selection of Used Vehicles, Financing Options, Serving Manhattan Beach, Westchester, Mar Vista, Pacific Palisades, Santa Monica, Playa del Rey, Beverly Hills, Inglewood, Malibu, Venice, Culver City, Brentwood, Westwood, West Hollywood, Bel Air, Ladera Heights and El Segundo but all over Southern California and LA. ALL ADVERTISED PRICES EXCLUDE GOVERNMENT FEES AND TAXES, ANY FINANCE CHARGES, ANY DEALER DOCUMENT PROCESSING CHARGE, ANY ELECTRONIC FILING CHARGE, AND ANY EMISSION TESTING CHARGE”. Airport Marina Honda - Your Helpful Honda Dealer! 2019 Honda Insight Touring Modern Steel Metallic 1.5L I4 SMPI Hybrid DOHC 16V LEV3-SULEV30, CVT. Airport Marina Honda! www.airportmarinahonda.com, Excellent Selection of Used Vehicles, Financing Options, Serving Manhattan Beach, Westchester, Mar Vista, Pacific Palisades, Santa Monica, Playa del Rey, Beverly Hills, Inglewood, Malibu, Venice, Culver City, Brentwood, Westwood, West Hollywood, Bel Air, Ladera Heights and El Segundo but all over Southern California and LA. ALL ADVERTISED PRICES EXCLUDE GOVERNMENT FEES AND TAXES, ANY FINANCE CHARGES, ANY DEALER DOCUMENT PROCESSING CHARGE, ANY ELECTRONIC FILING CHARGE, AND ANY EMISSION TESTING CHARGE”. Airport Marina Honda - Your Helpful Honda Dealer! 2019 Honda Insight Touring Lunar Silver Metallic 1.5L I4 SMPI Hybrid DOHC 16V LEV3-SULEV30, CVT. Airport Marina Honda! www.airportmarinahonda.com, Excellent Selection of Used Vehicles, Financing Options, Serving Manhattan Beach, Westchester, Mar Vista, Pacific Palisades, Santa Monica, Playa del Rey, Beverly Hills, Inglewood, Malibu, Venice, Culver City, Brentwood, Westwood, West Hollywood, Bel Air, Ladera Heights and El Segundo but all over Southern California and LA. ALL ADVERTISED PRICES EXCLUDE GOVERNMENT FEES AND TAXES, ANY FINANCE CHARGES, ANY DEALER DOCUMENT PROCESSING CHARGE, ANY ELECTRONIC FILING CHARGE, AND ANY EMISSION TESTING CHARGE”. Airport Marina Honda - Your Helpful Honda Dealer! 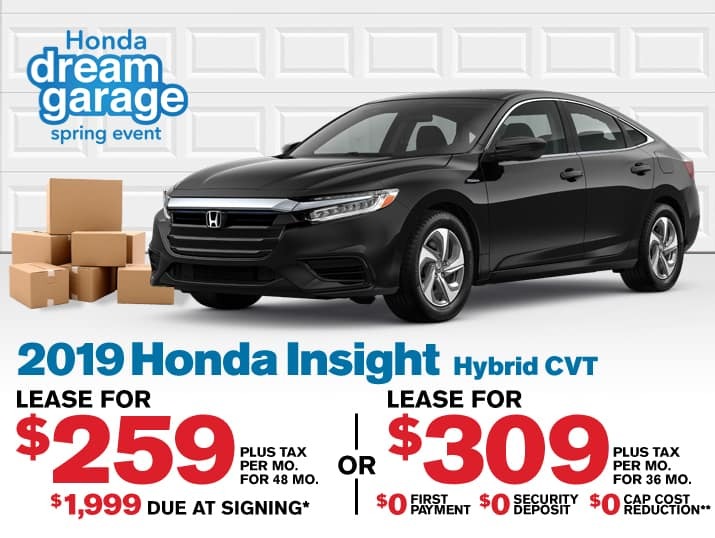 2019 Honda Insight Touring Crystal Black Pearl 1.5L I4 SMPI Hybrid DOHC 16V LEV3-SULEV30, CVT. Airport Marina Honda! www.airportmarinahonda.com, Excellent Selection of Used Vehicles, Financing Options, Serving Manhattan Beach, Westchester, Mar Vista, Pacific Palisades, Santa Monica, Playa del Rey, Beverly Hills, Inglewood, Malibu, Venice, Culver City, Brentwood, Westwood, West Hollywood, Bel Air, Ladera Heights and El Segundo but all over Southern California and LA. ALL ADVERTISED PRICES EXCLUDE GOVERNMENT FEES AND TAXES, ANY FINANCE CHARGES, ANY DEALER DOCUMENT PROCESSING CHARGE, ANY ELECTRONIC FILING CHARGE, AND ANY EMISSION TESTING CHARGE”.